Home History Peas, figs, thunder, donkeys – what do you know about Palm Sunday? 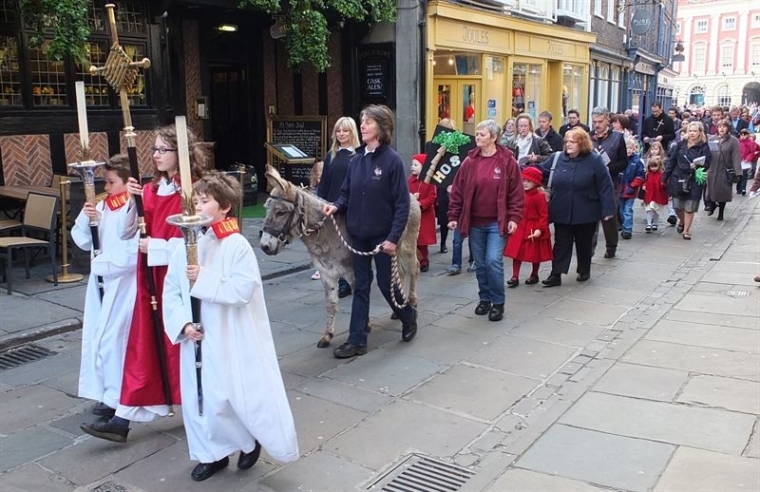 Peas, figs, thunder, donkeys - what do you know about Palm Sunday? Palm Sunday is an important date in the Christian calendar, but why is this day associated with processions, palms, donkeys, thunder, lightning, peas and figs? Read on to find out more about the religious and folkloric significance of this festival. 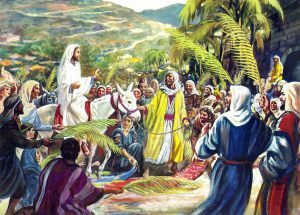 What does the Bible say about Palm Sunday? Palm Sunday – the last Sunday in Lent – marks the start of Holy Week. It commemorates the day on which, according to the Bible, Jesus entered Jerusalem on a donkey and was welcomed by an enthusiastic crowd. The crowd greeted Jesus by laying palm leaves at his feet – a common way of paying homage to heroic figures in the ancient world. Palms were also symbols of peace and victory. Jesus’s entry into Jerusalem would have been especially significant for the Jews, as an Old Testament prophecy stated that people would recognise the Messiah when he rode into the city and lay palms at his feet. All this was very disturbing for the political and religious authorities of the time, who saw Jesus as a dangerous upstart. The commotion caused by Christ’s arrival in Jerusalem made them more determined to have Jesus arrested and crucified. Christ’s arrival on the donkey was – in the eyes of many – even more miraculous because the donkey was unbroken and had never been ridden before. The Gospels record how Jesus asked his disciples to go to a village where they would find an unbroken colt and to bring it to him. How do Christians celebrate Palm Sunday? Many Christians take part in activities inspired by Christ’s entry into Jerusalem. Palms are often given out to worshippers and – after attending special Palm Sunday services – the congregants are given crosses made of palm leaves to take home. In some Christian denominations, these palms are later burnt. The ashes are kept and smeared on people’s foreheads in the shape of a cross on Ash Wednesday the following year. In many parts of the world, there are holy processions to commemorate the procession formed by Christ and his followers when they entered Jerusalem. Such parades sometimes feature live donkeys. In England, many Palm Sunday observances were banned during the Reformation. 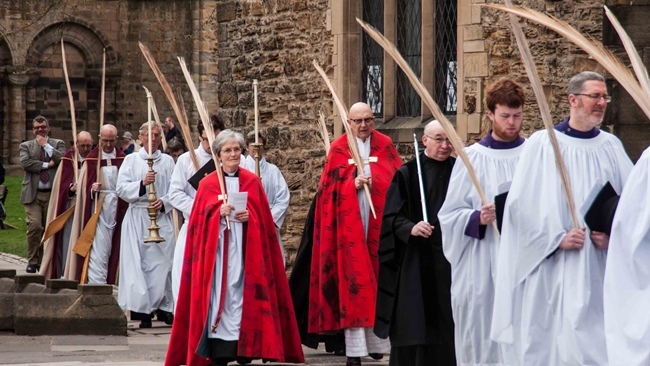 Though some of these practices were revived in the 20th century, the celebration of Palm Sunday is rather low-key in the Anglican Church and some other Protestant churches. Palm Sunday is followed by Maundy Thursday, Good Friday (which commemorates Christ’s crucifixion), Easter Sunday and Easter Monday. What foods are associated with Palm Sunday? Palm Sunday is still in Lent – a time when Christians have traditionally avoided eggs, meat, alcohol and rich fatty foods – so the foods associated with Palm Sunday tend to be simple and modest. 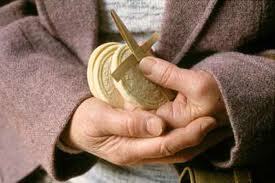 In England, small biscuit-like cakes called pax cakes used to be handed out after Palm Sunday church services. Pax cakes, which seem to have originated in Herefordshire in the Middle Ages, were stamped with a picture of a lamb and a flag, representing Christ as the ‘lamb of god’. Pax means ‘peace’ in Latin. Figs were also a common Palm Sunday food. This is because of a Bible story stating that Jesus cursed a barren fig tree on his way into Jerusalem. Figs were consumed in puddings and pies and were so commonly eaten that Palm Sunday was often known as ‘Fig Sunday’. In the north of England and Scotland, peas are a traditional Palm Sunday food. Peas – which were used to make dishes like split-pea soup – were also called carlings. For this reason, Palm Sunday was known as Carling Sunday in northern England and Car Sunday in Scotland. The main folkloric custom associated with Palm Sunday was ‘going a-palming’ – walking out into fields and woods to gather flowers and other plants to decorate houses and churches and make into crosses. Because palms do not grow in Britain and many people couldn’t afford to buy imported ones, they had to make do with local plants. Box, cypress, catkins, hazel, yew and willow were all gathered. As well as being strewn in front of church processions, in some areas these plants were used to decorate the graves of loved ones on Palm Sunday. The plants used in the processions were gathered up afterwards and taken home because there was a common superstition that they could protect houses from thunder and lightning. What’s going on in Durham this Palm Sunday? 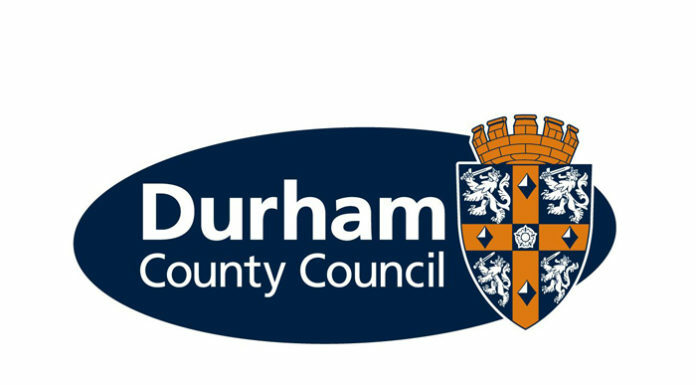 There will be a special Eucharist in Durham Cathedral. The service will begin at 11.15 am on Palace Green, from where palm branches will be carried into the cathedral in procession.